A fact of life is that we all age. And as people age, they begin to struggle with certain activities, like for instance going to the bathroom. For the elderly, the bathroom is perhaps the trickiest room in the house filled with a number of safety hazards. Because mobility gets affected by age, an elderly person might take more time and effort to perform certain bathroom tasks. Not to mention how the bathroom is a tight, wet area with loose rugs and slippery floors that increase the risk of a person falling and getting injured. Luckily, there are many modern aids that can improve mobility and reduce the risk of slipping or falling in the bathroom. In the bathroom, one of the biggest issues is balance. 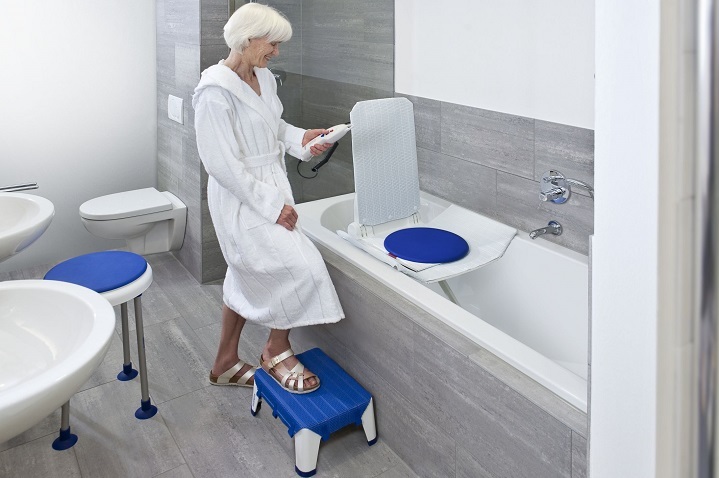 It’s important to maintain balance in order to prevent slips or falls, and that’s why grab rails are some of the most common bathroom aids for elderly. They can be installed around the walls of the bathroom and be used for support while moving around. A grab rail next to the toilet bowl can also allow the person to easily push or pull themselves up. It’s very important that the bathing zone, whether it’s a tub or a shower cabin, is fitted with grab rails. This way, the person can have a steady support while taking a shower on their own or with the help of a caretaker. Something as simple as sitting down and standing up requires a considerable amount of strength and flexibility. So, using the toilet might become a problem for weak, elderly people. A toilet fitted with a special raised seat can provide them with safety and comfort. Such a seat preserves the independence of the person by allowing them to use the toilet without someone else’s assistance. Sometimes the person doesn’t have enough strength to be able to take a shower up right. Luckily, there are specialized shower chairs that can help overcome this challenge. They are available in all kinds of designs, with padded seats and backrests for comfort and armrests for support. Some shower chairs can also be permanently mounted on the wall of the shower area for greater ease of use. Bathroom tiles and humidity are always a dangerous combination that can result in a bad fall regardless if you’re an elderly person or a young individual. That’s why non-slip floor mats are part of the essential bathroom aids for elderly. Ensure that the shower stall or the floor next to the bathtub is always covered with a rubber safety mat that has a suction cup back which will keep it firmly in place. Also, remove any scattered items on the bathroom to minimize tripping.